Adventure Hunting is your guide to hunting and fishing adventure worlwide: Africa, South America, USA, Argentina, Australia, Bolivia, Cost Rica, Eastern Cape, Nebraska, Panama, Zimbabwe. travel, tourism, adventure travel, hunting, budget travel, travel specials, fishing, Adventure Hunting is your guide to hunting and fishing adventure worlwide: Africa, South America, USA, Argentina, Australia, Bolivia, Cost Rica, Eastern Cape, Nebraska, Panama, Zimbabwe. This package contains our four most popular animals. 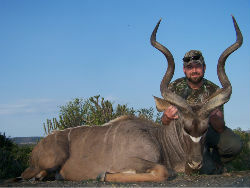 The Magnificent kudu is the most sought after plains game species. 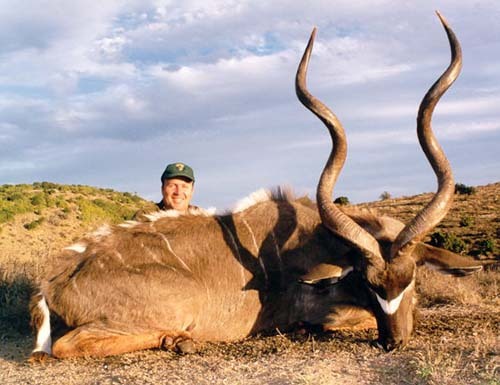 Our area along the Great Fish River in the Eastern Cape, has the highest concentration of kudu in Southern Africa. Success rates are over 95%. 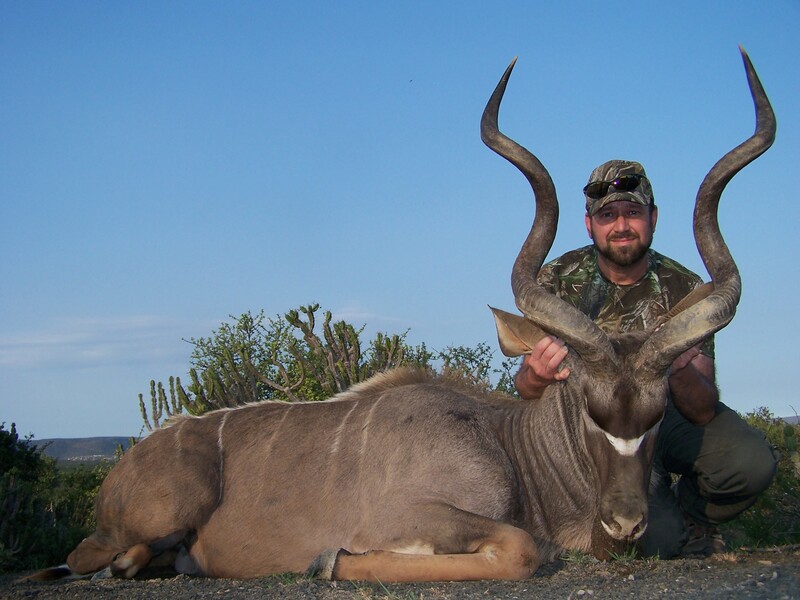 We hunt the kudu in the rugged mountains and steep ravines that they call home. 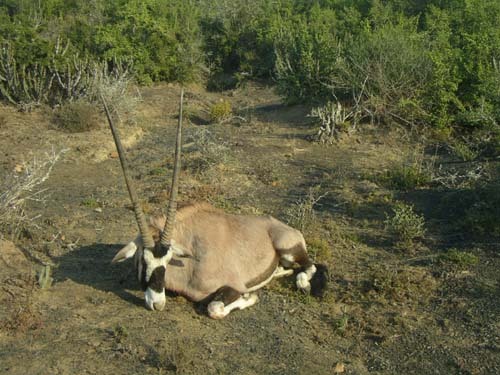 The valleys and semi open areas of this region are ideal habitat for the gemsbuck. We have good numbers of this species and every year our lands yield many outstanding trophy’s. Hunting the other animals in this package will take you to other habitats and terrain providing a varied and rich over all experience. The package also includes all meals, accommodations, airport transfers, PH (Professional Hunter), trackers, skinners, taxes, field prep of trophy’s, and even beer, wine & daily laundry. There are no hidden charges, the only extras would be flights, tips, and taxidermy/shipping. 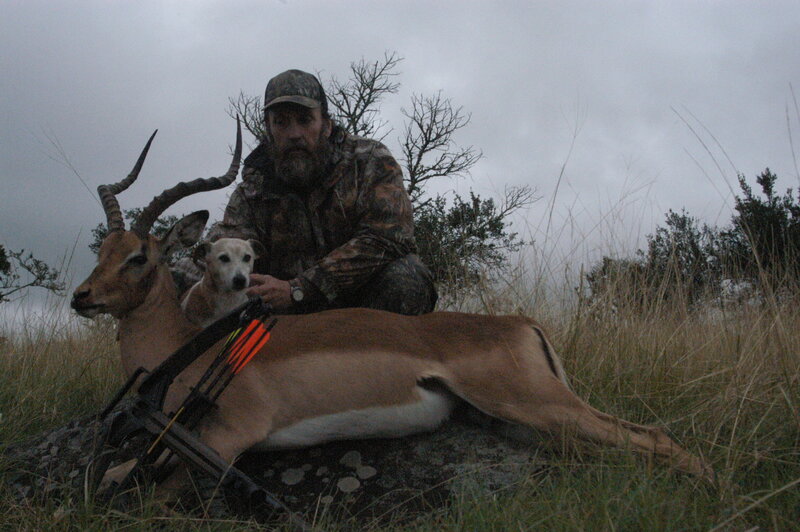 All our hunts are strictly fair chase on over 500,000 acres near East London, South Africa. This is not a game farm or pen hunt. Rifles, bows and pistols welcome. Hunt is actually 9 days as the arrival day and departure day are included in the cost but do not count against your hunting time. As with all of our packages all children 18 and under can accompany an adult free and they can share in the animals from the package. Additional animals can always be taken as per the trophy list. Our full time staff in the US will assist in every aspect of planning your safari. We are able to provide wholesale flights, as well as assist with all other travel arrangements, gun permitting, etc. After the hunt we have our own full service taxidermy shop in house and will either dip, pack & ship to your personal taxidermist or mount your trophy’s and ship them to your door. No doubt during this entire process you will have many questions, we are available to answer them with the convenience of a toll free call or email at any time. During the whole process you will deal with one person that takes care of every detail. 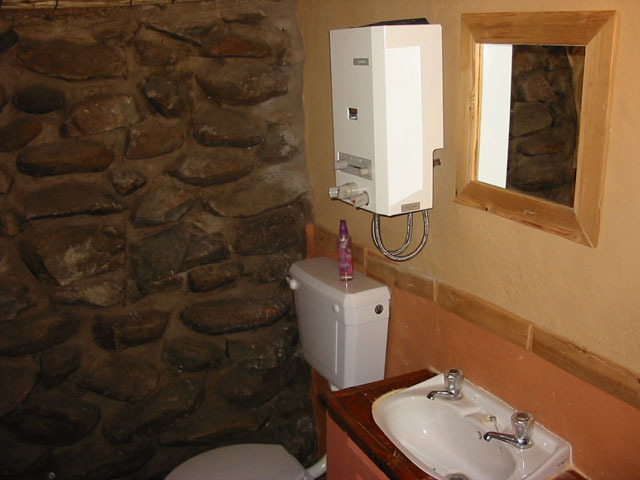 We have been working in African for 20+ years and look forward to being at your side throughout the entire experience! With us both your deposit and final payment are completely refundable at any time, for any reason, right up until the moment you are to step on the plane. We will not take your money if you cannot come hunt with us! NOTE ON ALL PACKAGES: There is no refund for any animals not taken while hunting on a package. All animals wounded but not recovered count against animals in package. We will make every effort to recover your trophy. We have some of the best trackers in Africa as well as some of the best tracking dogs you will ever see. Very few get away! Also please note that there is no charge for the day you arrive and the day you depart. For example for example a 7 day hunt is actually 9 days as we pick you up at the airport and return you with everything taken care of in-between. You only pay for the time you are in the field hunting. At all times we treat you like a member of our family. See the Eastern Cape’s famous pachyderms at peace and at play in the thickets of the unique Addo Valley Bushveld. Along with a wide variety of other bushveld game, Addo’s bush provides refuge to these gentle giants, descendants of the former vast herds of elephants that once roamed freely in the area. The Park is sanctuary to some 350 Elephants as well as buffalo, Lion, Black rhino, plenty of birds and several species of antelope. Lion were reintroduced about two years ago and sightings have been good. After your game drive enjoy a light lunch at the Addo Elephant Park Restaurant. 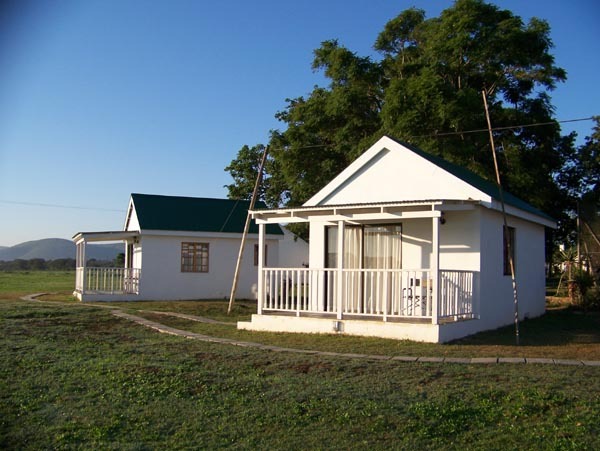 Visit Grahamstown and follow in the footsteps of the 1820 settlers. The broad tree-lined streets and imposing public buildings are the legacy of a time when Grahamstown was the Cape’s second most important city. Visit the oldest official letter box in SA, the Natural Science, History & Observatory Museum, SA Institute for Aquatic Biodiversity and the 1820 Setters National Monument. No tour is complete without a visit to the spectacular Grahamstown Cathedral. The National Arts Festival held in July every year celebrates the best in South African and imported talent and regularly attracts more than 30 000 festoons who come to enjoy more than 500 shows – everything from opera to jazz and comedy to drama – as well as a huge diversity of other creative disciplines. Depart for Kenton-on-Sea (you could choose to incorporate a horse ride along the beautiful coastline) swim in the warm waters of the Indian Ocean, take a stroll up the magnificent beach, then pay a visit to Port Alfred, this historic little coastal town lays on the Indian Ocean and straddles the glorious Kowie River an ideal place to purchase your curios for back home. A short drive from Port Alfred is Bathurst Village, picturesque, rustic and reminiscent of England's Cotswolds, this town is known for its gracious old buildings and huge oak trees. In Bathurst you’ll find the world’s biggest pineapple, the toposcope where you can view how the land was divided by the 1820 settlers, St John’s Church, the incredible views at Horse Shoe Lookout and the old mill. Visit the Bathurst Agricultural Museum which is a tribute to the 1820 Settlers’ courage and entrepreneurship. Enjoy a tranquil lunch at the Pig & Whistle, South Africa’s oldest pub. The Bay of Port Elizabeth is located on the southern-eastern coast of Africa along the shorelines of Algoa Bay, the city dates back to arrival by sea of 4 000 British Settlers in 1820. Shopping - From “Market style” shopping, to craft shopping at different flea markets, to up market boutique and mall shopping, you will find exactly what you need. Bayworld – Situated on the beachfront you can sit back and relax and meet the dolphins - Dolly and Domino - and seal presentations hosted at the Oceanarium. The Snake Park houses a wide variety of exotic and indigenous snakes as well as an impressive variety of Eastern Cape Reptiles. The museum includes natural and cultural history artifacts – shipwrecks, dinosaurs and much more. Situated just outside of Kenton-on-Sea enjoy riding alongside the dunes and on the beach beside the gentle Indian Ocean. Be on the lookout for dolphins and whales that often pass through these waters. Perhaps incorporate this outing with your Bathurst Village and Kowie River Safari. This makes a great day’s outing. Choose the one, three or five hour trails and enjoy the exceptional scenic beauty and diverse vegetation. With abundant game (mountain zebra, klipspringer, kudu mountain and grey rhebuck to name but a few) and a myriad of birdlife, you’ll be sure to experience Africa in a way not easily forgotten The Zuurberg mountain trail provides you with a unique experience and horse trails are undertaken on well schooled, very sure-footed Basuto pony/Boerperd cross-breeds. Your experienced and well informed guide will be close at hand to answer all your questions. All the necessary riding gear is provided. My wife and I would like to thank you and your staff for the great experience we had during our stay with you. Greg our guide showed great skill in his hunting and knowledge of the land and animals which lead to a very successful hunt. He was very patience with my wife and her picture taking. We would like to thank your cooks and maid staff the food and service was excellent. Your accommodations were very comfortable and made our stay enjoyable. Once again thank you for a great hunt and the experience, and for the plentiful game there was to hunt. I would recommend your services to anyone and have told many people about you. 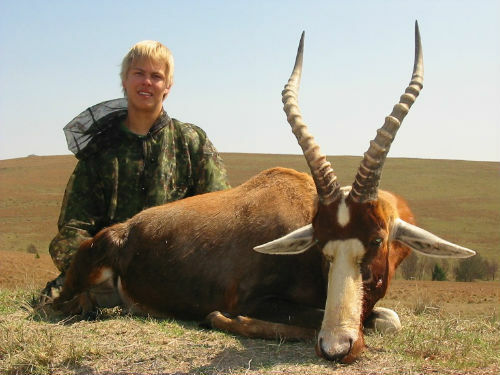 Hunting Africa is the lifelong dream of many sportsmen. We have designed our packages to bring Africa within reach of everyone. 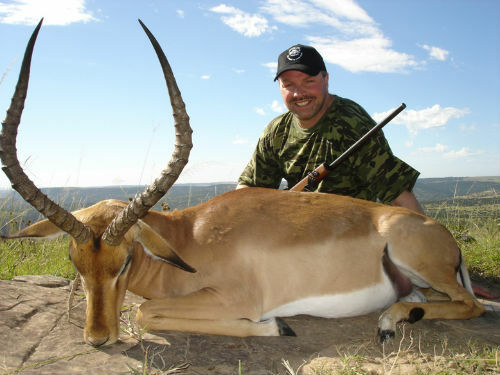 This hunt takes place in the Eastern Cape area of South Africa. This is a region of varied terrain from fertile valleys to steep mountains. It is home to large numbers of game. The Karoo is cattle and sheep country much like the American South West. Many of the farmers allow us to manage game on their property for extra income. 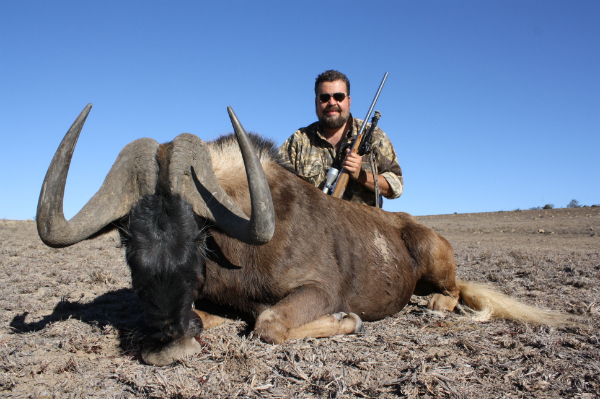 Eighty percent of our hunting takes place on the open range with standard cattle and sheep fencing. The other twenty percent is on high fence ranches. Certain species can only be hunted year round in a high fence area, thus we need to use these properties as well. All of our hunting is strictly fair chase. Our primary method is spot and stalk. We have blinds and tree stands as well and hunt with rifle, bow, pistol and black powder. We have farms designated bow only. We do not hunt from vehicles or in pens! Also we are not tied to one property. Our home farm of 5000 acres serves as a base from which we access over 250,000 acres of prime hunting land leased exclusively by us. Trophy quality is guaranteed because of our trophy game management policies. Only mature animals are taken and a limited quota is set for each property. This allows a large number of animals on the land and also gives them time to mature into the quality trophies you seek. Our animals are all natural production and not bought at action and stocked. Our exclusive leases with landowners assures that we are the only ones taking the prime specimens off their properties. Seasons are reversed in South Africa from North America. May-August is winter and temperatures can get quite cold. Perfect hunting weather! Nov through March has warm to hot days followed by warm evenings. We usually hunt early and late this time of year with plenty of time to relax during the day. 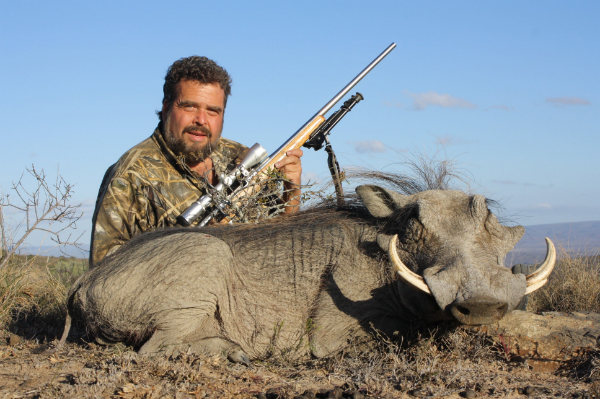 On our hunts you will be accompanied by a certified professional hunter. This will be either one client and one PH or two clients and one PH depending on how you want it. We NEVER mix groups! Even if there is only one of you, you will have exclusive use of the lodges during your hunt and not be mixed with hunters that you do not know. 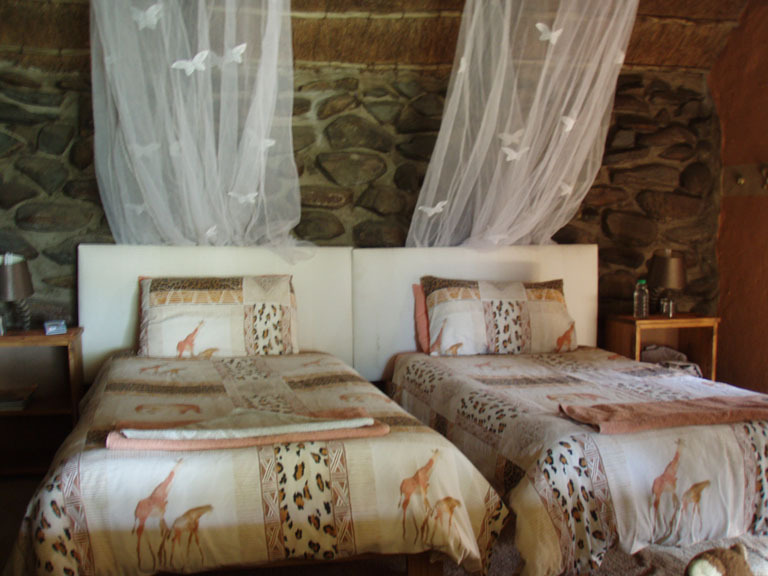 We have four different lodges at our disposal and often move between them depending on what species you are hunting. As stated above we are not tied to one property like many other operations and can move to were the best specimens of the species you are hunting are located. 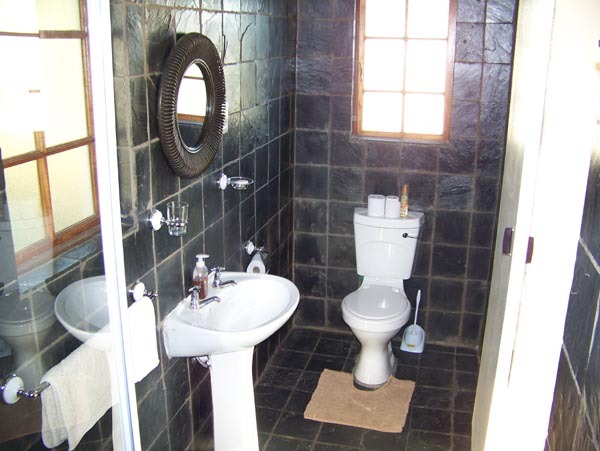 Our lodges vary from an authentic bush lodge with thatched roof cabins to a very comfortable former South African farm house with all the modern convinces. Africa is literally out the front door. 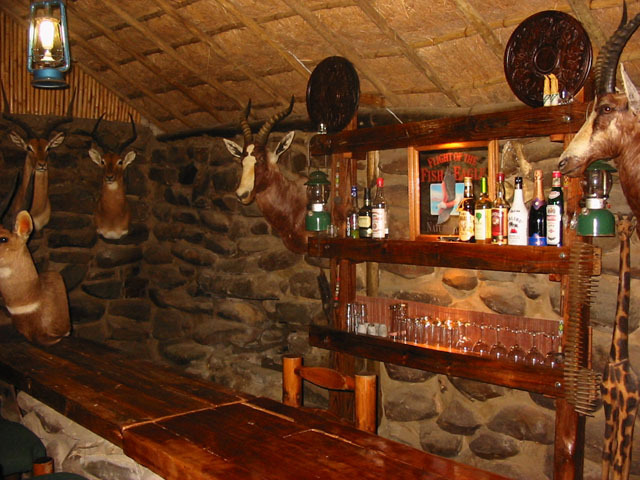 All meals will be prepared by our staff and include many wild game dishes as well as homemade salads and deserts. You will not go hungry! 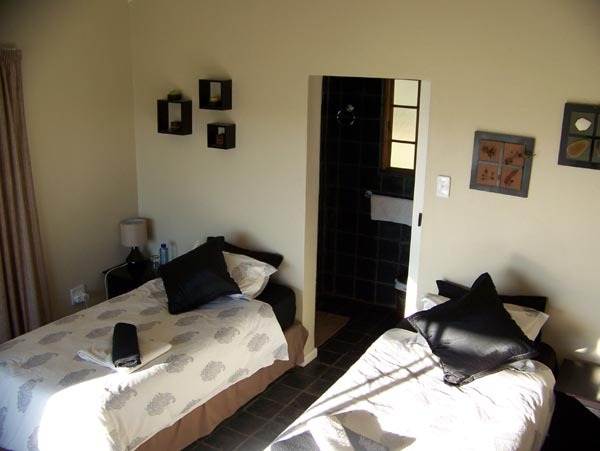 We include all soft drinks, juices, water and tea and coffee as well as local beer and wines. We pride ourselves on offering not only a great hunt but also a complete experience including great food, good company and many additional features that others charge extra for. Non-hunters are more than welcome! We encourage our clients to bring their families and offer a non hunting rate that reflects this. 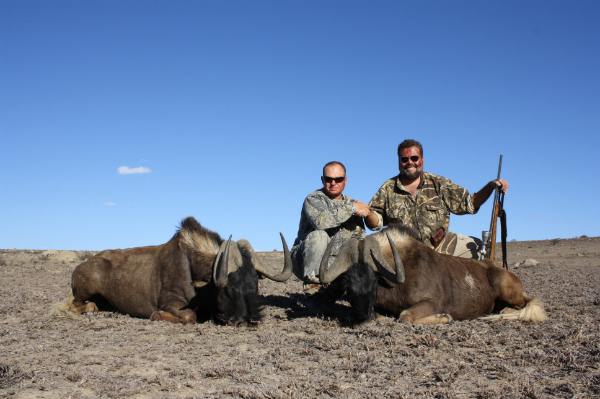 If your non hunter does not want to follow you in the field many optional tours can be arranged. We have many opportunities from camera safari to spas and golf. We will be glad to put together an exciting program of day trips from the lodge for the non hunter. 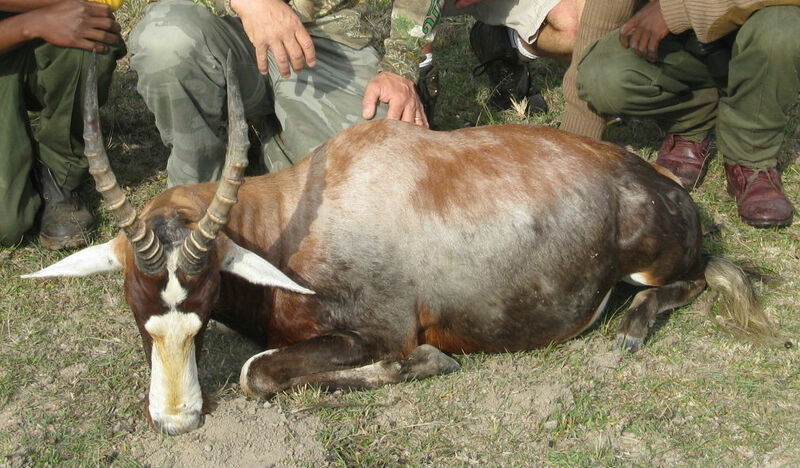 · Field preparation of trophies and forwarding them to a taxidermist or shipping agent of your choice. I just wanted to let you know that I received my animals yesterday afternoon and everything made it in great shape. I was very impressed how everything was wrapped in bubble-wrap so that nothing could get rubbed or damaged. Opening that crate was kind of like Christmas morning and opening all the presents. I can’t wait to get started on my mounts but will have to wait for a while until I get everyone else’s stuff done. I am seriously looking to come over again in 2012. I would really like to make it a late April – early May hunt again. It seemed like that timeframe was very good for hunting and the weather. I will keep you posted.